RockRidge Canyon is located off of Hwy #3 near Princeton, BC. Follow the turn off signs to the Princeton Golf Club which is about 2.5km East of Princeton on Hwy #3 (Amber Hill Road). Continue on this road (which becomes Willies Ranch Road). You will see a sign on the right indicating RRC is an additional 9 km. Watch for a narrowing with a cattle guard and two vertical wooden logs, you are now on the RRC property. Guests and visitors please proceed to the Guest parking lot and check in at the Property Admin Office. The basemap in your vehicle GPS might not be correct. 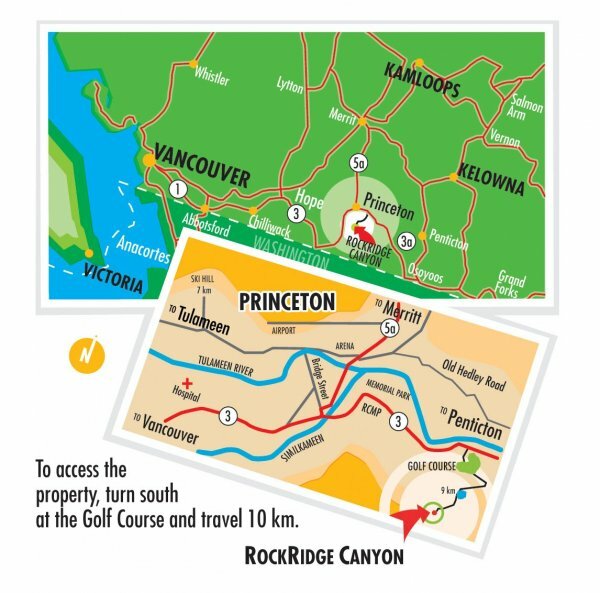 If you want to use your vehicle’s navigation system, we highly recommend navigating to “Princeton, BC” and then following the text directions (above). Google has updated their basemap. You can now use Google Maps navigation on your mobile device to get to Rockridge Canyon. RockRidge Canyon is this close!